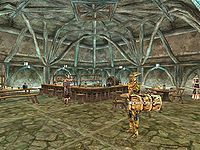 Entertainers is a plug-in that adds the option to entertain the patrons of the Eight Plates in Balmora for Dulnea Ralaal. You can perform a variety of tricks to receive a small cash reward. A song — What is the singer without the song? Pick up a copy of either The Baladeer's Fakebook or The Battle of Molag Beran from your local booksellers. Jobasha's Rare Books in Vivec has both for sale, though there are copies at several other booksellers as well. Note that you only need one of these books. The Battle of Molag Beran is the most popular among the Dunmer. Esta página foi modificada pela última vez à(s) 14h03min de 13 de março de 2016.